Columbus, OH, February 24, 2016 — JAAS Systems today announced that its software, JAAS Advanced Manufacturing Software (JAMS) for Acumatica has been recognized as an Acumatica-Certified Application (ACA). To become an Acumatica-Certified Application, JAAS Systems has demonstrated commitment to quality by passing the Acumatica software test and aligning to future Acumatica roadmap releases. Acumatica provides cloud-based business management software that empowers small and mid-size businesses to accelerate their businesses and drive growth. Built on cloud and mobile technology and a unique customer-centric licensing model, Acumatica delivers a suite of fully integrated business management applications, such as Financials, Distribution, CRM and Project Accounting, on a robust and flexible platform. In an interconnected world, Acumatica enables customers to take full control of their businesses, play to their organizations’ unique strengths and support their clients by following them anywhere on any device. For more information, visit www.acumatica.com. Columbus, OH, February 9, 2016 – JAAS Systems was pleased to attend and once again participate in the Acumatica Partner Summit in Orlando, Florida last week. We were a Gold Sponsor for the event and involved in numerous sessions during the Summit as well as conducting a JAMS for Acumatica Training Class. 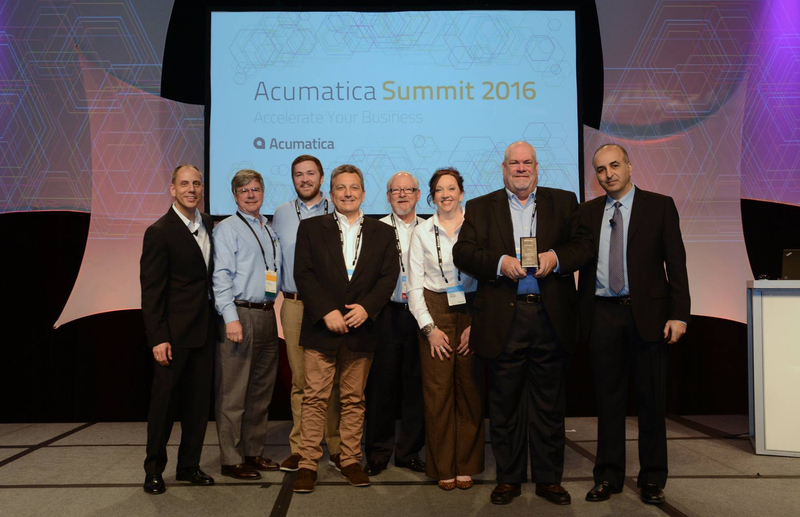 JAAS Systems was recognized as the 2015 Acumatica ISV Partner of the Year – Americas and John Schlemmer, Chief Product Officer of JAAS Systems, was among nine people named an Acumatica Most Valuable Professional. Among other highlights at the Summit were the announcements of a new JAAS Advanced Manufacturing Software module, Estimating, and the first demonstration of another new module, Product Configurator, which is currently in development, due to be released in the early part of Quarter 2, 2016. Columbus, OH, January 27, 2016 – JAAS Systems is pleased to announce a partnership between itself, Acumatica and JDB Solutions Group to provide the Acumatica community with Manufacturing and Field Service Barcode and Data Collection. JDB Solutions Group has interfaced with JAAS Advanced Manufacturing Software (JAMS) to provide XScan for Acumatica, a highly flexible, wireless data collection solution, ideal for manufacturers. Using an Apple or Android device, XScan for Acumatica collects labor, material issues, production entries and status data relating to work orders. It then validates and communicates that data, in real-time, to JAMS for Acumatica, whether your device is connected to the internet or not. That is correct – the solution will work offline and will validate until you can get back on Wi-Fi or Cellular. XScan for Acumatica allows manufacturers to minimize costs while maximizing productivity. JDB Solutions Group specializes in manufacturing automation, including barcode scanning technology and equipment, process design, and consulting. For more than a decade, JDB Solutions Group has been designing, implementing, and supporting effective and efficient manufacturing solutions. They also offer custom data integration services, allowing clients to leverage legacy or third party applications as part of an overall manufacturing solution. JAAS Systems is pleased to announce its participation in Acumatica’s Partner Summit; being held February 1-5 in Orlando, FL. JAAS Systems will once again be a Gold Sponsor for the Summit. Our team will be participating in ISV presentations and customer roundtables as well as conducting a JAMS for Acumatica training class. The JAMS for Acumatica training course is a 3 day session that covers the functionality of the JAMS for Acumatica Manufacturing Suite. The training is designed to make users comfortable with installing and configuring the JAMS for Acumatica software; as well as, identifying manufacturing opportunities, demonstrating the software and understanding its strengths and where the highest probability to win exists. Upon completion of the training class, attendees will be granted access to the M100 JAMS for Acumatica Basic and M200 JAMS for Acumatica Advanced Online Exams, which is a component of the Application Specialist Badge. For more information on the Acumatica Partner Summit and our JAMS for Acumatica training class please visit http://summit.acumatica.com/.